There is no doubt that the Italian government under Matteo Renzi is seeking to achieve higher growth and stimulate employment and wants greater flexibility from the EU on the country’s budget deficit. The government’s struggle looks tough since its budgets are based on a 0.8% GDP growth forecast for this year. 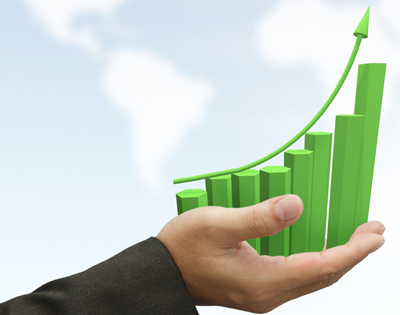 For its part, the Italian employers’ federation Confindustria is predicting that GDP will rise by 0.2% in 2014 and 1.0% in 2015. Yet much is happening. The Rome government is seeking to undertake such a number of disparate changes. What’s more, the ECB is helping Italy’s cause with the most loose of policies. “[ECB Chief Mario] Draghi is doing his utmost for Italy, which is too simply too big to fail and giving the impression that everything is fine,” an Italian bank analyst, who asked not to be named, told SNL. Investors have bought into this story. “There is a disconnect between the market perception and the reality of the banking sector where is there is no sign of the growth people are expecting. People are being carried away by business plans, which do not make any sense but were used to raise some money,” the unnamed analyst said. He further expressed skepticism about the rigor of the ECB stress test — pointing, for example, to differing stresses applied to property in France and Italy — and suggested that the regulator was being “as complacent as possible.” This, too, serves to support share prices. Not everyone is quite as pessimistic. David Grinsztajn, a bank analyst at AlphaValue, told SNL that the valuations of Italian banks have risen strongly in the last year, not least on the basis of bank management predictions and business plans foreseeing a recovery in 2016 or 2017. These plans, Grinsztajn said, were “optimistic but not particularly aggressive in terms of their cost of risk” reflecting mid-cycle predictions and the price-to-book ratios for the leading banks such as Intesa Sanpaolo SpAwere not especially demanding at 0.7x or 0.8x. UniCredit SpA has risen by 65% in the last year and its price-to-tangible book ratio according to SNL figures is around 0.8x. Pre-crisis, price-to-total asset ratios were much higher than today. Moreover, the shares of the Spanish banks had clearly performed more strongly than those of their Italian peers and trade around 1x book. “Italian banks do trade at a discount. The structural problems of the Italian economy are reflected in this way while the Spanish recovery translates into higher multiples. On my view, with the exception of Mediobanca SpA, Italian banks are fairly valued on the basis of expectations for 2016. The banks face two challenges: The asset quality review and the possibility that the recovery be disappointing,” Grinsztajn observed. 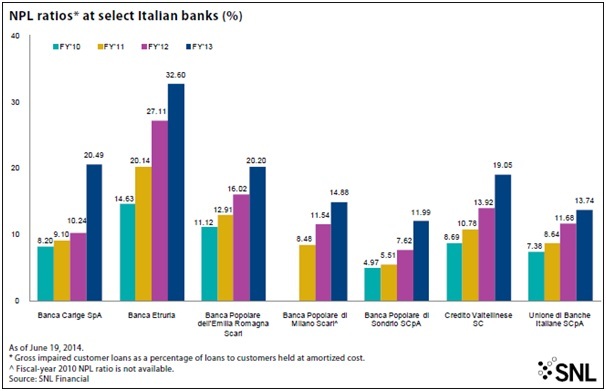 Looking at several purely domestic banks, SNL’s charts highlight the difficulties of Italian domestic banking. Returns and asset quality, after a long recession, remain a critical issue. Nonperforming loans — in our charts, defined as gross impaired customer loans — have risen continuously and strongly since 2010, soaring in 2013. There was some improvement in the ratio of credit costs to pre-impairment profits in the first quarter 2014 compared to full-year 2013. However, last year did see some preparation for the asset quality review with a large correction to asset values at Banca Carige SpA, for example. Under the Italian classification system, which is generally considered stringent, gross impaired customer loans are subdivided into four categories: NPLs, doubtful, restructured and past due loans. NPLs tend to form the bulk of the gross impaired loans. Thus credit costs look high while reserves (and equity) compared to impaired loans appear rather low. UniCredit — which is an international bank — had a 52.4% coverage ratio on gross impaired loans at the end of March. This is distinctly higher than the figures shown by the domestic banks, according to SNL. A delayed recovery surely spells further loan losses. Thus the current outlook for profits and returns, which have been desperately weak in recent years, as our chart shows, cannot be good in 2014. Asset quality is, however, an issue not just because of the state of the economy. Many if not most of the banks listed are troubled, not least because of problems of governance and, in some cases, corruption and fraud. Capital raises — including the injection of foreign capital — and international supervision together with bank mergers look to be the way forward. However, given the uncertainty over asset quality, valuing Italian banks looks a hazardous business, not least at this stage in the cycle. Buying Banca Etruria, given the very high NPL ratios seen in our charts, would today demand considerable courage. It is perhaps no surprise that after one failed merger attempt, the bank is still openly seeking partners. The story of Carige alone would and doubtless will fill a book. The Italian judicial authorities have seized assets worth €46 million belonging to individuals close to ex-CEO Giovanni Berneschi of which he himself held some €21.9 million, including luxury apartments in Rome and Milan, La Repubblica revealed June 25. The intriguing relationship between the Carige foundation and the Vatican bank Istituto per le Opere di Religione is now also being investigated by the Italian authorities. Meanwhile, Carige has declared that its €800 million capital raise might not suffice. This raises the question of who might invest given that the entire bank is valued at around €800 million and its current prospectus comes larded with risk warnings. Carige’s heavy losses seen in our tables for 2013 were largely due to goodwill write-offs and raised loan loss provisions, yet the bank’s underlying performance was not inspiring given sharply falling net interest and fee income year over year. Presumably, the situation will not change much in 2014. Even Unione di Banche Italiane SCpA, the largest and clearly the best capitalized of the banks surveyed, has fallen foul of legal authorities with accusations of blocking regulation by the Bank of Italy and fixing the bank’s leadership. Government investigators raided UBI bankers’ homes and offices in May. These are not, unfortunately, isolated incidents. It is no wonder that the Italian state auditor is highlighting the way that corruption is blocking Italy’s recovery. Our figures indicate that a general and credible cleansing of Italy’s banking system is required. Ideally, the ECB asset quality review and stress test would solve the problem, but simple solutions look to be in short supply.